The Royal Mail produce a Business & Residential file of 28 million UK addresses - every address in the UK on a single file. We've extracted the Business Addresses from the file and offer this at a reduced annual cost. Basically you can just order this Business Data List for half the normal fee. 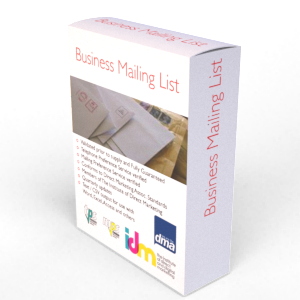 If you need more than just the address then we also have other specific lists by business activity, 2,700 different types of business that range from Abattoirs through to Zoos. So if you're looking for a Business Data List of Accountants, Builders or Plumbers etc. then you're in the right place. You can select by employee size, turnover, geography and many other attributes. The business data list includes every commercially available business address that exists on Royal Mail's Postcode Address File (PAF). That's circa one million sites that businesses operate from which span the UK. The Business Data List excludes company type, telephone number however it does provide a very strong and very cost effective solution for analysis, door drop, distribution and direct marketing. PAF data is essential to ensure that addresses are clean and accurate for mailing purposes. *Grid references can be appended to the business list data for the appropriate licence fee or licenced separately for mapping and GIS applications. The Business Data List (PAF) is supplied in a Comma Separated Variable Text format but can be supplied as either tab delimited or as an Access database or other data format. A link to the company list will be sent to you when you complete your order. The Business Data List is licenced for a year. Various options are available including single, corporate, multi user and internet licences. All of the records we supply will have come straight from the latest Royal Mail Postcode Address File, and will be updated throughout the licence period every 3 months; that is a new Business Data List will be sent to you every 3 months whilst you remain in licence.